I never was a big meatballs and spaghetti type of girl, but when Ryan made these Lamb, Spinach and Feta Meatballs, I fell in love. Combine lamb, spinach, feta and salt and pepper. Divide and roll into balls. Place the balls on a foil-lined baking sheet coated with olive oil. Serve with a side salad and some garlic cream sauce. Tacos, Tacos, Tacos – I love tacos! Tacos are one of my favorite healthy carb meals. The key is to just use ingredients that are minimally processed and as local and fresh as possible. AND if you want to make your own corn tortillas, here is a great and simple tortilla recipe! Put the masa harina into a bowl and add in salt. Heat the water then slowly add it into the masa harina and salt. Mix as you go. I don’t usually use more than 1 1/2 cups. Add water until the dough is spongy, but not sticky. Roll dough into a log and wrap in a damp paper towel. Let the dough sit for 1 hour. Then roll out 2 inch balls after the dough has sat for 1 hour. Flatten the dough using a rolling-pin or a tortilla press. (I use a tortilla press and put cling wrap on both sides of the press so the dough won’t stick. I then cook the tortillas in a hot cast iron about 1 minute on each side or until the tortilla is cooked to your liking. Do you love tacos? 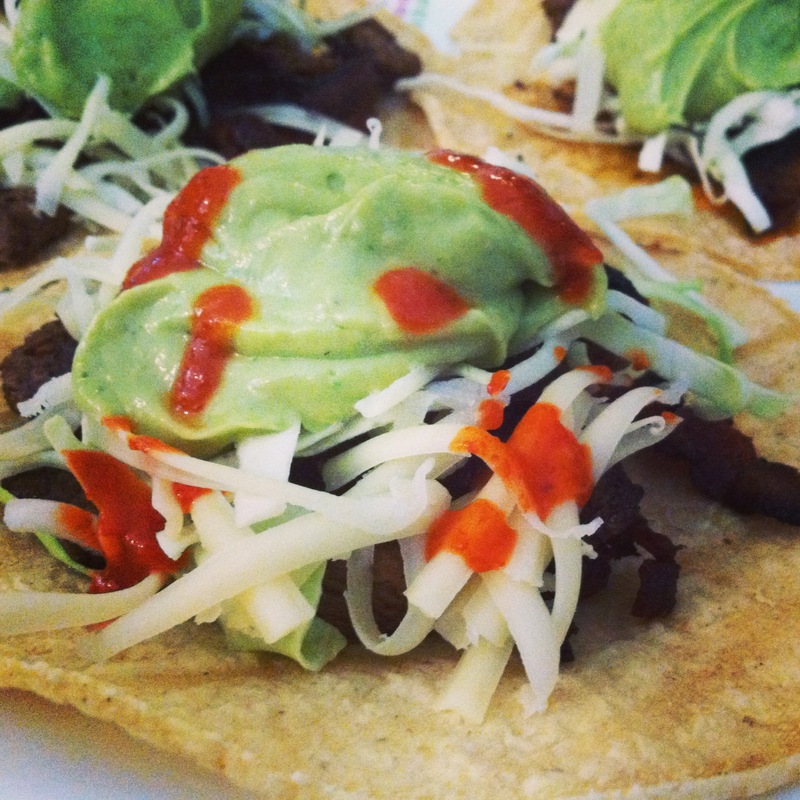 What is your favorite taco recipe? After a hard push up/pull up workout yesterday morning, we were craving a few carbs. So Ryan, like he always does, came up with a great new breakfast. Heat a skillet and cook the ground beef. Then cut up the cooked sweet potato into chunks and add it to the ground beef with the spices. Stir and lower the heat. Cook until ground beef is fully cooked and everything has mixed together. In a separate pan, cook 2-4 eggs until sunny-side up (or to your liking). 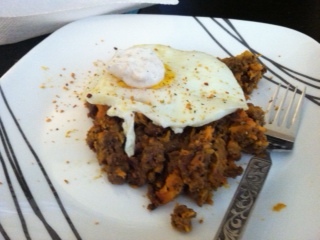 Place the eggs on top of the hash and serve. We also added a dollop of sour cream mixed with Cajun seasonings to the top. The recipe above serves two people. Anyone else love hashes? Ever made one with sweet potatoes before? What’s your favorite!?! There is this local, family-owned restaurant called Taco Mesa here that has amazing Alambre Steak Tacos. We are like OBSESSED with them. These Alambre tacos are corn tortillas filled with steak, bacon, onions, peppers and cheese. They are even better with Taco Mesa’s amazing Avocado Salsa. So yesterday Ryan decided he was going to try to make a variation of them and the salsa. Here is his Bacon Ribeye Tacos with Avocado Salsa. Cook the bacon in a skillet on high. Once the bacon has browned, remove to a plate. Place the chopped ribeye into the pan with the bacon grease. Add cumin, paprika, chili powder, hot sauce and salsa to the steak in the skillet. Lower the heat and let the steak simmer in the salsa and spices. Add back in the bacon. While the steak is cooking, add the avocados, cream, salsa verde, olive oil and cilantro to a food processor. Process until smooth. Then put the salsa into a bowl. Once the steak mixture is almost ready, heat the tortillas in a skillet or microwave to warm them. Shred the cheese and cabbage. Then divide the steak mixture between the 7-8 tortillas. Top with cabbage, cheese and avocado salsa. Sprinkle with more hot sauce if you would like. Makes 7-8 tacos and lots of leftover Avocado Salsa. What restaurant meals do you enjoy making variations of at home? I’ve always loved anything with buffalo sauce on it. I make buffalo wings and even buffalo cauliflower all the time. Actually I’m not sure which I love more…buffalo sauce or cauliflower! While I wasn’t feel cauliflower today, I thought it would be delicious to make Buffalo Chicken “Pasta” using spaghetti squash since I was in the mood for spaghetti squash AND buffalo sauce. However, I quickly realized we didn’t have any chicken…only some ground beef. So instead of a Buffalo Chicken “Pasta” recipe, Buffalo Beef “Pasta” was born. And boy was it delicious! Preheat oven to 375. Slice spaghetti squash in half and coat with olive oil, salt, pepper and some garlic powder. Bake for 40 minutes to 1 hour. Once spaghetti squash is done, let cool and then scrap out with a fork. Place in a bowl and save until meat and sauce are done. Heat a skillet on high. Place meat in skillet and begin to brown. Add garlic, salt and pepper. Once meat begins to brown, add tomato sauce and hot sauce. Cook on high until meat is browned. Then simmer for a few minutes on low. While meat is simmering, add spaghetti squash and mix well. In a microwave, combine cream and blue cheese. Melt blue cheese. 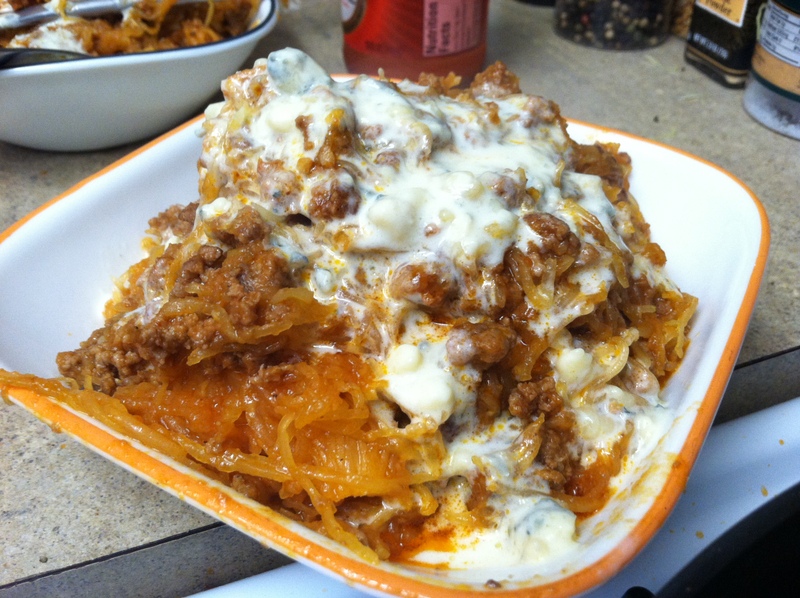 Once spaghetti squash and the beef sauce are combined, top with a bit of the melted blue cheese sauce. Serve. Should make about 4-5 servings. Thinking about this meal now….It could be yummy after Thanksgiving when you have leftover turkey to use up!!! GOING TO HAVE TO TRY THAT! YESSS! I think everyone needs at least one dish that they just always have the ingredients for lying around. Those ingredients that you always have stocked in your cabinets or buy each week at the store just to make sure you never run out of them. A dish, while maybe not the most delicious dish you’ve ever eaten, is something you can enjoy every time and not be so bored with that you would rather go eat out then quickly make it. A dish that you can quickly make if you haven’t been able to do any meal prep and have no leftovers to quickly heat up. For us, omelets (or scrambled eggs) and chili are our healthy go-tos (and I don’t mean the super long cooking chili…I mean the dump everything into the cast iron and let it simmer for 10 minutes and then devour chili). We always have ingredients for both around – eggs, tomato sauce, some sort of vegetable and ground beef. Since we usually have at least a pound of ground beef lying around, if we make a quick chili, there are even leftovers to eat later! 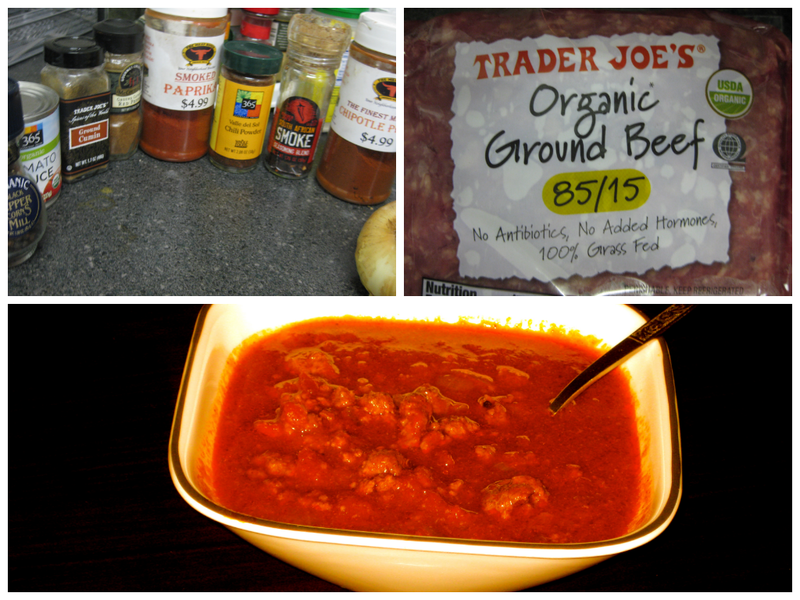 Below is the basic quick chili we make along with a link out to my favorite cauliflower chili (which is a bit more time-consuming). While a few basic spices are listed below, you can add in others like chipotle powder. When the beef is still a little pink, add in tomato sauce and spices. Stir. Mix vegetables into the sauce and then lower heat to low. Let simmer another minute or two, stirring everything together occasionally. Serve with maybe some grass-fed or raw milk cheese on top. If we have the ingredients for guacamole, we will also usually top it with that. This basic chili recipe can also easily be served over spaghetti squash as a “spicy” meat sauce if you have any lying around! And if you happen to love cauliflower as much as I do and have a bit more time to cook, try this chili variation – Cauliflower Chili. What is your go-to healthy dish? What ingredients do you always have lying around? While I’ve been enjoying an assortment of nut butters from Ingr-EAT-ients, I couldn’t help but want to try to make some of my own again. Ever since I made the macadamia nut butter about a month ago, I’ve been wanting to try a nut butter variation of one of my favorite healthy desserts – Salted Dark Chocolate Macadamia Nut Bark. Which when I tried making it the other day, along with a plain Macadamia Nut Butter and a Vanilla Honey Cashew Butter (which reminded me of cookie dough), ended up sort of tasting a little like Nutella. Not exactly like Nutella, although I’m sure you could make something even closer using hazelnuts, but enough that it really really REALLY tasted like a treat! Although I could simply eat the chocolate macadamia nut butter by the spoonful, it was also great on an apple. And I can’t wait to try it in the Yonanas later this week…Just image….Salted Chocolate Macadamia Nut Banana Ice Cream….DROOL…. Anyway, here is the Salted Chocolate Macadamia Nut Butter recipe! Place nuts in a food processor. Process until a fine powder. Add in chocolate, salt and oil. Continue to process until smooth. This will take only a minute or two. If you would like it to be chunky, put in a few nuts at the very end and blend for only a second or two. 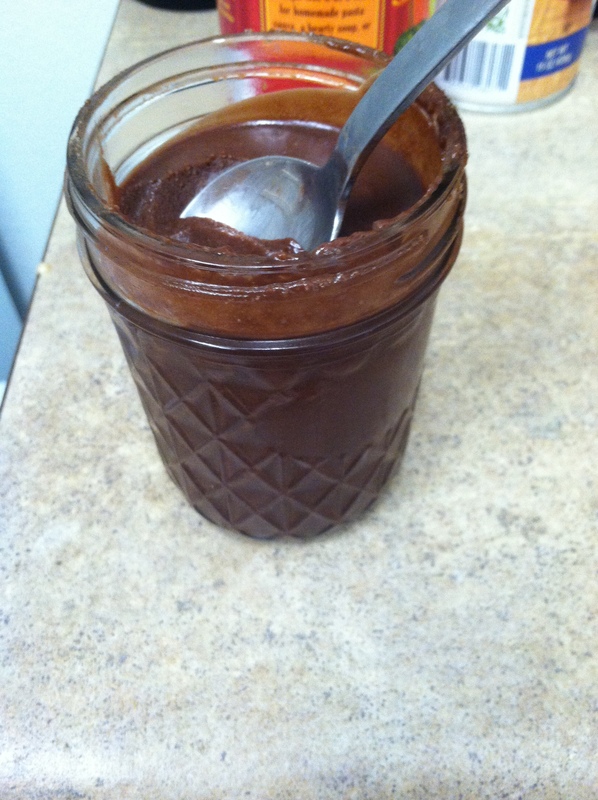 Have you ever made a chocolate nut butter at home? What would you eat the Salted Chocolate Macadamia Nut Butter on? There are certain comfort foods, certain meals, from my childhood that I crave when I get stressed. However, some of them don’t fit the way I like to eat on a regular basis…which means that if I really want them, I have to find a way to make them healthy. Cut chicken into chunks and sprinkle with 1/2 tbsp oregano, 1 clove garlic and salt and pepper. Cook the chicken in a skillet until browned and cooked through. While cooking the chicken, slice olives and tomatoes. Dice garlic. Add olives, tomatoes and 1 clove garlic to a bowl with olive oil, 1 tbsp oregano, salt and pepper. I find that the longer everything sits in the olive oil sauce, the more flavorful the dish becomes even if you choose to reheat it later! What comfort foods from your childhood do you occasionally miss? Have you found a way to make a healthy variation of them? I don’t really ever crave pasta, but there are some days when I WANT carbs even though my body really isn’t asking for them. On those days I find that carb-like dishes (like cauliflower mash) always more than satisfy me. 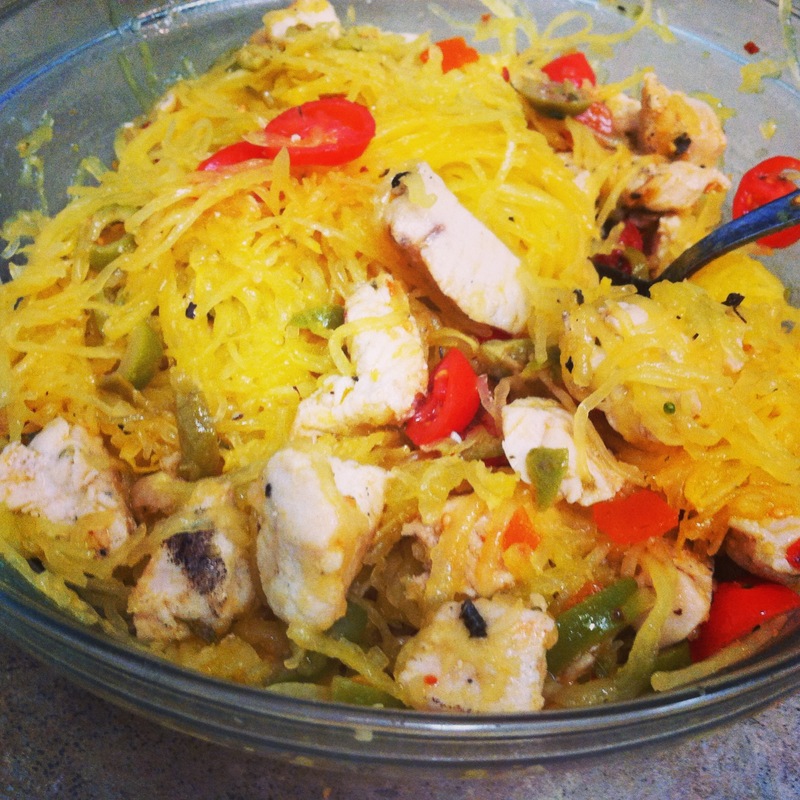 And since spaghetti squash are in season, they are the perfect food to curb my carb cravings. 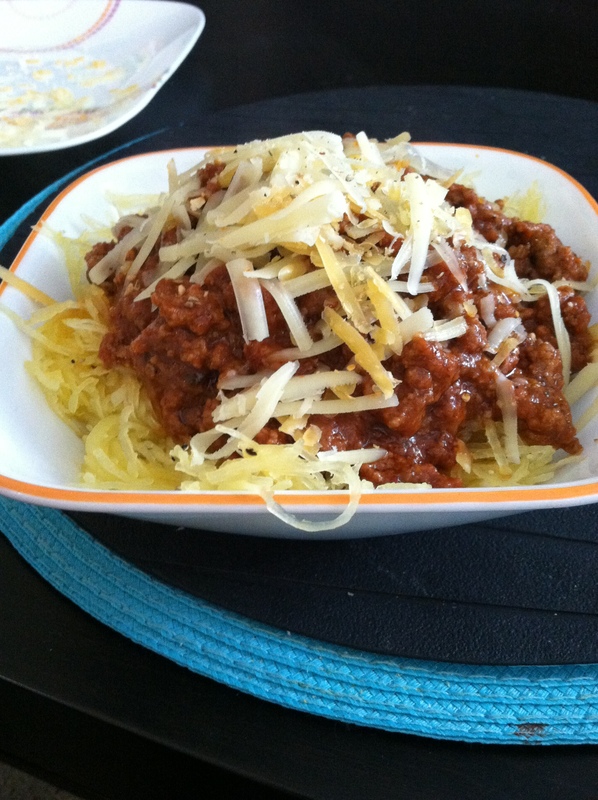 If you crave pasta or just want carbs even though your body doesn’t really need them, Spaghetti Squash and Meat Sauce is a great way to satisfy those cravings! Slice the Spaghetti Squash in half and scoop out the seeds. Drizzle with olive oil and add salt and pepper to taste. Place on a baking sheet with cut side up. The spaghetti squash will take anywhere from 30 minutes to 1 hour depending on the size. Once the spaghetti squash is cooked, scoop out the inside with a fork to create long strands. When the spaghetti squash is close to done, place the grass-fed ground beef in a skillet with a bit of oil. Have the heat on high to start to brown the meat. Add chopped garlic, spices and tomato sauce when meat has started to brown. Cook on high another minute and then lower flame to low. Let simmer another 5-10 minutes at least. When sauce is done, scoop on top of some spaghetti squash and serve with a sprinkle of raw milk or grass-fed cheddar. And in case you occasionally crave dessert like I do, a great way to end the day is with a scoop of healthy ice cream. Honestly never thought I would say “healthy” and “ice cream” in one sentence, but when the ice cream is made of bananas, it is actually healthy. 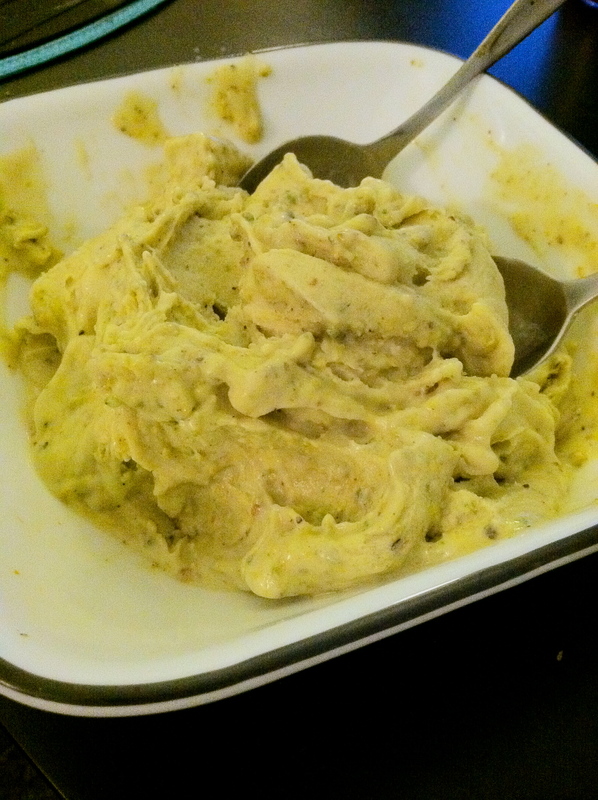 I’ve been loving the Yonanas and tried out a Banana Pistachio Ice Cream last night, using a pistachio nut butter made by Ingr-EAT-ients. I gave it a good stir but while it tastes good, the pictures don’t look that appetizing…I need work on my food staging. Let the bananas defrost for a minute. Turn on the Yonanas and place a piece of banana in the machine followed by a tablespoon of nut butter and another piece of banana. Keep alternating till all ingredients are used. Then give it a quick stir and serve. Anyway, a great dinner and dessert that felt like a treat and was exactly what I needed! What are your favorite recipes when you’re craving a treat? Fall is pumpkin time – pumpkin seeds, pumpkin pie, pumpkin lattes, pumpkin flavored frozen yogurt…. Fall is also a time when our diets start to go to shambles because of all the delicious “once a year” treats that are around. HOWEVER, there are ways to enjoy some of those seasonal foods, like pumpkin, without derailing your healthy eating progress. 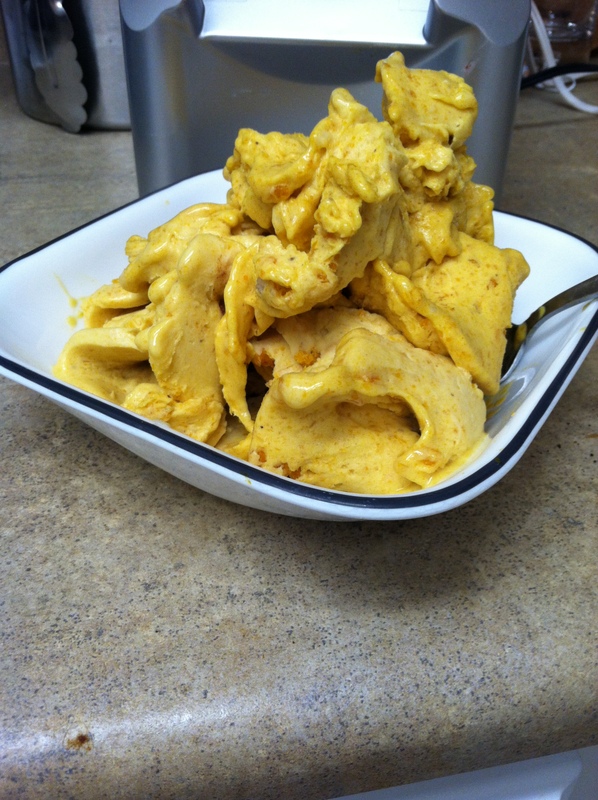 So I decided to create a HEALTHY Pumpkin Frozen Yogurt using my awesome Yonanas which I’m mildly obsessed with. Remove the frozen ingredients and let them thaw just a bit. Sprinkle bananas with spices. Turn on the Yonanas and place a quarter of banana in the Yonanas followed by a piece of frozen pumpkin. Mash down. Keep alternating banana and pumpkin until all of the ingredients above have been combined in the Yonanas. What are your favorite healthy fall treats?